You know me, I tend to be annoyed by the super trendy things and really avoid jumping on the food trend bandwagon. There are a couple of exceptions to that – if it happens to be seriously amazing (have you tried the new Instant Pot? ), or if I’ve already been enjoying it for a long time. This one falls into the second category. I have been eating and thoroughly enjoying avocado toast for a long time – way before it was a trendy food thing. Really, I love it because it’s delicious. And I mean DELICIOUS. It’s full of flavor and nutrition as well as being beautiful and so incredibly easy and satisfying. It’s one of my favorite breakfast recipes because it’s so easy, satisfying and I love it. It’s also a great way to use up those avocados before they get rotten, because, let’s face it…avocados are SO finicky, and you have to use them at just the right time or you’re out of luck. One of the great things about avocado toast is how versatile it is. Sure, you can just have toast with avocado slices on it, but when you get tired of that, you can dress it up in a bunch of different ways. I like to top mine with a poached egg, or bacon, prosciutto, feta cheese, black beans and corn, honey…I could go on and on, but you get what I mean. It’s so versatile! No, avocado isn’t a light breakfast. In fact, avocado is pretty high in calories, fat and even points. BUT, and that’s a big but, it’s a great way to eat your points. Avocado is packed with healthy fats. The ones that are great for your brain, heart, cholesterol and especially your taste buds. 😊 Avocados are a great source of several B vitamins, including folate, vitamin C, vitamin E, potassium and a really good source of fiber. They’re a low GI food, so it’s great for you if you’re watching your carb intake as well. Pair your avocado with a whole grain bread and you add even more fiber, minerals and vitamins. Top your toast with some smoked salmon or an egg and then have a side of fruit and you have an incredible breakfast in absolutely no time. I don’t know about you, but for me, it’s always kind of a gamble to get a good avocado. Sometimes I’ll get a bunch of good ones and sometimes I can’t find a good one for anything. So, here are some tips on using avocados, including choosing the right one and storage. Choose an avocado that is slightly soft but have no sunken spots or cracks. It should have a slight neck, instead of being round on top, which indicates that it’s been more tree ripened and will have a richer flavor. A firm avocado that is in good shape can be ripened after purchase and can be less likely to have bruises due to transport. Leave a firm avocado in a paper bag or just in your fruit basket for a few days to ripen. The skin should darken slightly as it ripens, but it’s best to see if the fruit is slightly soft, but not squishy. Once ripe, they can be refrigerated for up to one week to help halt further ripening (or prevent rotting) and to help prevent the loss of nutrients, such as vitamin C.
It’s best to store whole to avoid oxidation. However, if I need to store a cut avocado, I sprinkle the cut side with lemon juice, leave in the pit, then place a piece of plastic wrap directly on the cut side, making sure there are no air bubbles. I then wrap the remainder of the plastic wrap around the avocado and store in an airtight container. It will help slow down the oxidation for up to a day but should be used quickly. WANT MORE AVOCADO RECIPES? TRY THESE! Remove avocado pit and skin, and place the flesh in a bowl. Add in lime juice, garlic, salt and pepper. Mash and mix with a fork. 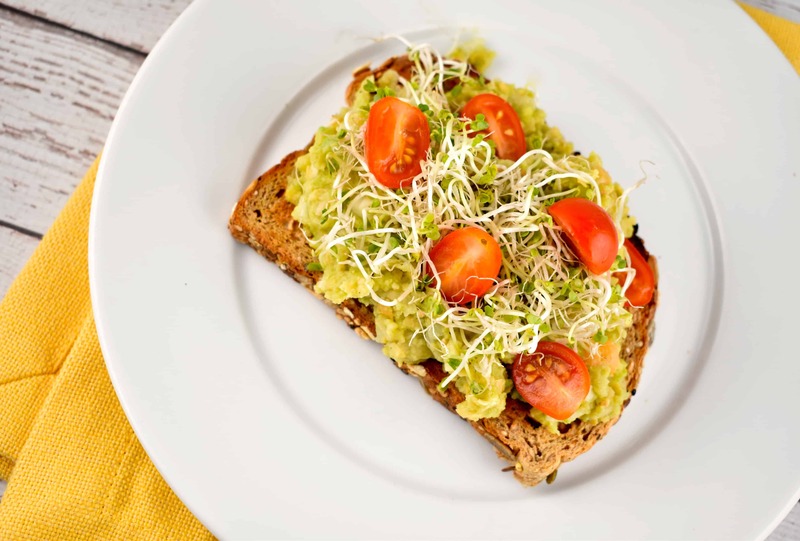 Toast bread, then top each slice with 1/4th of the avocado mixture, sprouts and tomatoes. One of my favorites as well. Thanks for posting. I’ve found a new twist with fewer points, depending on how you garnish: I top a fried egg white with the avocado mix. I sometimes add a piece of bacon and/or tomatoes. Yummy and drops a couple of points. Preparing it this way requires a sacrifice on my part because toast is almost my favorite food!